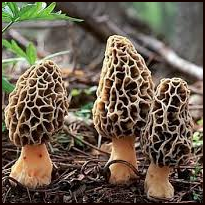 April brings us morel mushrooms, lamb and spring veg. We also have a pick of the best Easter recipes and a touch of vintage afternoon tea. Season’s Eatings – what foods are in season for April? Spring lamb is also in season now. Combine it with seasonal veg such as mushrooms, spring greens and rocket. Of course Easter falls in April this year. Here are a few traditional Easter recipes for those who would rather make it than buy from a supermarket! In order to ring the changes from going out for a Sunday dinner type meal for Mother’s Day we opted instead for afternoon tea. Marmalade on the Square is a reasonably new café in Wakefield and they opened up especially for Mother’s Day afternoon tea. It made a really lovely change and the café itself is a great space with a vintage feel including lacy napkins, fine bone china and lots of vintage ornaments and embellishments – many of which you can buy. I would definitely recommend it. 1 Response to "The 3Style Foodie Blog – April"